You and your bird will have hours of fun spinning the molecules on this fascinating toy. Toy may be hung upright or straight across. Bird Toy includes wooden ABC blocks, tropical beads and small Spinning Molecules. Bird toy measures 6" long and 5" wide. Mini Spin Me Round Bird Toy5CarolOctober 14, 2013This is a great, well-made versatile toy. My one-year old sun conure really took to it and loves climbing all over it! As an added bonus I've hung this on his sophomore play gym to change things up and keep him entertained! Mini Spin Me Round Bird Toy5Lisa WardJune 2, 2012This is a well thought out bird toy. 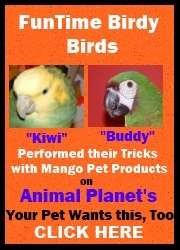 The middle balls are light enough to turn easily but durable enough to withstand our playful Conure's antics. He goes from one end of the toy to the other and reminds me of someone having fun at a slot machine in Vegas. Great appealing colors.